As a notary public appointed by your state, you will often run in to documents that do not have the required pre-printed notarial verbiage attached. The most common transactions notaries are asked to perform are jurat and acknowledgments. When performing a jurat act, the notary must administer an oath as well as witness the oath-taker signing the document. Your state may require you to record the transaction. If your document lacks the notarial verbiage, you may have to hand write it. To avoid forgetting any required verbiage or handwriting it, we created the Notary Jurat Rubber stamp. 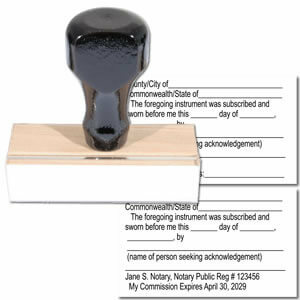 The Notary Jurat Rubber stamp provides ample room to record information and should be used with an additional ink pad. The Notary Jurat Rubber stamp is made quality handcrafted, American-made materials that is assembled in-house. Our detail-oriented team carefully secures the durable rubber die to the wood mount which ensures for a great impression every time it is used. The Notary Jurat Rubber stamp must be used with an additional ink pad and can be used indefinitely as long as the ink pad is well inked. The Notary Jurat Rubber stamp is a very useful supplemental stamp for any notary. The Notary Jurat Rubber stamp is to be used as a supplemental stamp and cannot act as your official notary seal.